I wrote a few days ago that I was feeling a bit bad about not taking down my Christmas lights. (They're still up.) The thing is, though, that I'm sort of happy to have them still hanging around. I've always loved Christmas lights. Not necessarily the razzle-dazzle, big-time displays, though those certainly have a place. No, I just like regular old lights -- strings that hang from eaves, wrap around porch posts or encircle a wreath. It doesn't really matter what color they are or what kind of bulbs, as long as they bring light to an unexpected place. A spectacular display in my hometown. For as long as I can recall, my family have had lights strung around the house at Christmas. For a while, they were icicle lights -- annoying, miserable, icicle lights, as it turned out. Strands of the icicle lights were inevitably tossed onto the roof by the incessant winds on our hill -- and, nine times out of 10, frozen there by icy weather. 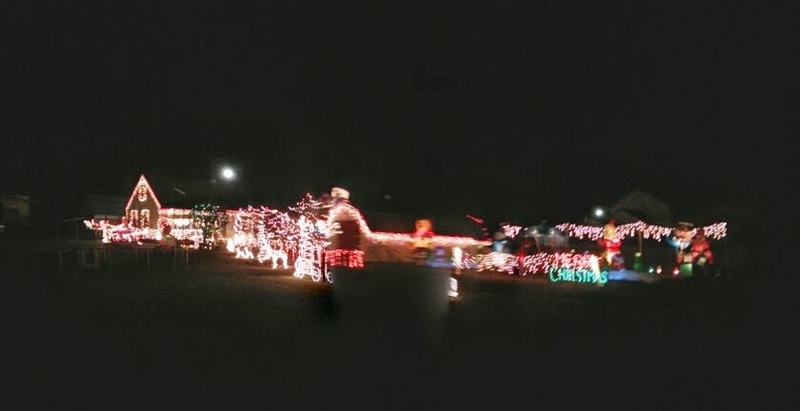 Dad loved those lights, let me tell you. Most often, however, my folks have had strings of old-fashioned white C9 lights -- those warm, glowing incandescent bulbs that can light up a room. With a string around the entire house -- and even up over the center of the house where the roof changes heights -- the entire yard gets lit by those lights. More importantly, the lights shine into each and every room of the house. They create a warm buzz about the windows, constantly hinting that something exciting might be just outside. In our new neighborhood, I was thrilled to see strings of red, white, green and blue popping onto the homes near ours. Even without a string on each and every home, our neighborhood got quite colorful during the holidays. As the lights have come down, one by one, I've been as sad as I always am to see the streets return to their January selves. There's nothing particularly cold, or even dreary, this year, about northern California. Nonetheless, it's tough to see a bejeweled street go back to being a non-bejeweled one. So, partially in protest, and partially in deference to the insurmountable list of other to-do's at home, my Christmas lights shall stay up for now. In this time of continued change, I'm thankful for a constant bit of light. Vivek found our weighing scale Sunday in one of the few remaining "chowder" boxes from the apartment -- and promptly weighed himself. 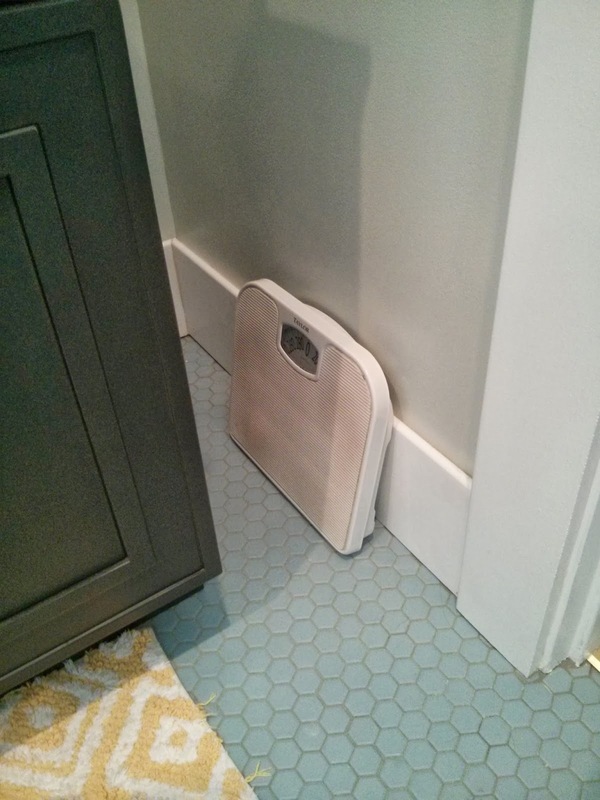 He even carried the scale around the house to test it out on tile and carpeted floors to make sure it was accurate. It lurks -- our weighing scale. I won't be weighing in right now. In fact, maybe not until February. Who knows? Maybe not at all. In the past three months, I've survived a move and a job change and then spent an incredibly relaxing, rejuvenating and delicious week celebrating Christmas with my family and loved ones on the East Coast. Have I gained a pound or two -- or even a few? Probably. My jeans still fit, and that's good enough for me. I've been feeling bad that I haven't had a chance to take down my holiday lights and garland on our front porch yet. Even Epiphany's happened! 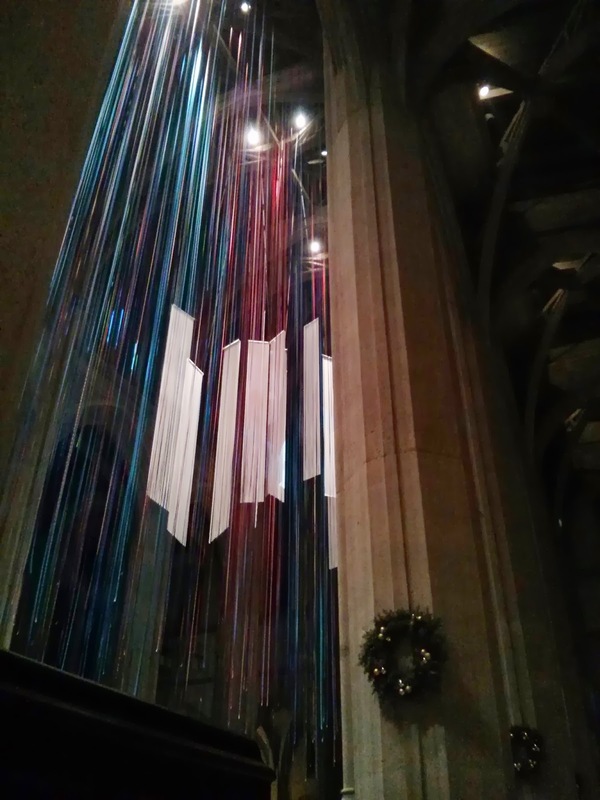 But lo and behold, there I was at Grace Cathedral tonight for Tuesday yoga, and their holiday greenery was still up. So I'm totally OK, right? Settling into in our new home has definitely included a struggle with the new work load. Our friends told us it was a whole new responsibility, but I had shrugged it off. Surely it was fun, too? Right? It is fun, but our nights and weekends are gone for the moment. Take Sunday: We were just settling down to watch some Masterpiece on PBS, finishing our last chores, when we realized we needed a tiny connecting piece from IKEA to put our old bed -- now the guest bed -- back together. So off we went! And since we were right by Trader Joe's and Home Depot, we ended up picking up a few other things, too. (Of course!) We did curl up on the couch with dinner to watch Masterpiece that night, but it wasn't until about 10 p.m.
And that was all after spending Tuesday washing the car, Thursday evening buying furniture and Saturday hemming and hanging curtains. 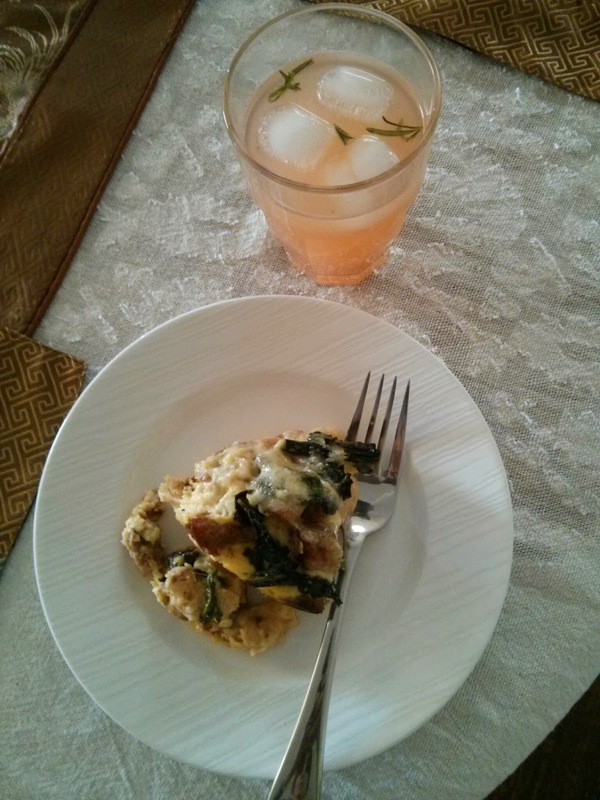 Kale-Spinach Strata -- A Success! I even made the grapefruit spritzer with rosemary (sugar not needed). Vivek and I inherited an incredible vegetable garden when we bought our house. And when I say garden, what I really mean is gardens -- four raised planter boxes, plus some assorted 'volunteer' veggies (think zucchini and purple potatoes) sprinkled in other planters and beds throughout the yard. I'm super excited about, if overwhelmed by, these gardens. My mom's always had a garden, and I've long wanted to try my hand at veggies. You might have seen my overly enthusiastic posts earlier this year about my third attempt (a charm!) at an indoor herb garden at our San Francisco apartment. 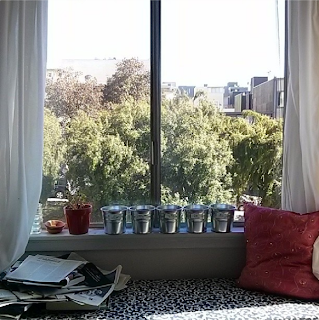 Sage, cilantro, California poppies and two types of basil bask in an afternoon glow just after being planted. So our huge outdoor garden is something of a thrill -- particularly the tomatoes, sage, chilies and still-unearthed potatoes it came with. We started using the tomatoes right away (especially after December's frost bit the vines and we had to pluck all of the fruit), and we've been giving out lemons from our yard's tree like it's going outta style. The one thing I haven't known what do with is the kale. So. Much. Kale. In multiple varieties. In fact, I learned just this morning that what my mother and I had diagnosed (via video chat) as an ornamental 'lettuce' is actually Kamome red kale, a bitter-tasting form of the leafy green. Super! In addition, we seem to have Lacinato and red Russian kale -- and, if I'm not mistaken, premier kale (see this helpful page for more details). The thing is: We don't really eat kale. I'm not opposed to it, and for such a nutritionally dense food, it's honestly pretty tasty. But it's just not part of my daily intake -- and I've certainly never seen it in an Indian cookbook. Last week, however, on our flight back from the East Coast, I found this delicious-looking recipe last week in the Real Simple I was reading. Kale strata, you say? With sausage and fontina? In. I now had a use for kale. This week, I hunted down the non-garden ingredients for the strata (even sending Vivek to get fontina with our regular groceries yesterday), and I ventured out into the backyard this morning to get the kale. It's freshest when just picked, right? I'd completely forgotten, though, that I've been underestimating the number of aphids on those curly kale leaves. Since we took ownership of the house, we've focused (naturally, right?) on getting the inside of the home settled, favoring being able to find, say, a toothbrush or the 1/2-cup measuring cup over getting the weeds and bugs out of the front and back yards. So the pests, both plant and animal alike, have made themselves plentiful. OK -- no biggie, right? Feeling optimistic, I still snipped a handful of kale leaves, dunked them into a bowl of salted water, weighted them down with a dish, and went off to church to pray while my aphids, I hoped, were floating to the top of the water. No dice. I came back to some aphids floating, to be sure, but still clumps of them all over most of the leaves. And attempts to rub them off proved insufficient at best. Have you seen the underside of a kale leaf? It's like a labyrinth of caves specifically designed as aphid hiding places -- or, if you prefer, little aphid villas. No wonder they love the stuff! 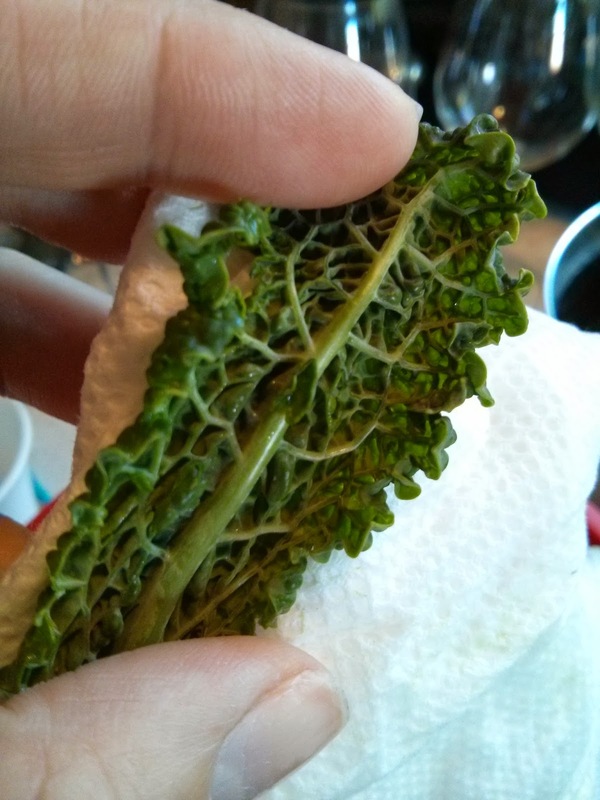 A young -- and remarkably clean -- kale leaf from our garden. Check out those curls! Check out those caves! I'll spare you a photo of the worst leaves -- but suffice that say that, unless some miracle cure reveals itself, most of our kale crop appears unusable. To save today's brunch, I took the few leaves I could clean off, mixed them with some baby spinach and created kale-spinach strata (ta-da!). I'm sure it will be equally delicious, if not quite as nutritious. As for moving forward: I'm sad to say it, but I'm pretty sure these kale plants have got to go. (Do you want to clean the leaves?) In their place, I'll be planting spinach -- a leafy green I do buy by the pound, and apparently a veggie less interesting to aphids. In my opinion, everyone wins. At least in my kitchen. I was thinking today of a scene from "Downton Abbey" (indulge me -- it starts tonight!) where Anna catches a cold -- a sniffle, really -- and is sent right off to bed by Mrs. Hughes. She barely sneezes and immediately earns some bed rest -- and she passes that in her pajamas with a good book. Just imagine! Now, I hardly want to trade in my modern-day medicine -- but when was the last time you truly got to relax while you were sick? Where you simply could loaf about, take naps as needed, read a book, watch a movie? Yeah, I can't remember either. And it's such a shame, since I understand from my doctor that my body heals itself while I'm sleeping -- not when I'm toying away on my laptop. Despite my cold, I've focused more on Resolution No. 2 (the house) than 3 (relaxing) over the past few days. Sure, I called in sick to work on Friday, and I generally kept my work laptop closed so I could rest. But I had to help build an IKEA bed that day in time for our new mattress to be delivered. On Saturday, I stayed home while my pati dev went out to get groceries, but I spent my time indoors hemming curtains instead of curled up with my "Christmas at the New Yorker" (I'm still trying to finish a story from the holiday season). I'm sure there are some who will say it's nice that we can be so productive these days while we're sick, mollified by Mucinex and Advil. But I find myself seeking that earlier practice of just resting when under the weather. After all, didn't Anna go back to work, all better, the next day? 2 for 3: Not so bad, right? Well folks: I'm down for the count. If I didn't know better, I'd say it's the flu -- but I got a flu shot. Do colds come with aches and fever now? Whether it's the ongoing settling-in-after-moving, my holiday diet or just the cold itself, I'm pretty beat. I took a rare sick day today and even made chicken soup tonight -- definite sick food for me. (Though pretty cool to make it from scratch for once -- Mom will be so proud!) And once this bug passes, I'm sure I'll be done with hot tea for a while. Is this cup nine today? Or 10? At any rate, a long way of saying I fell asleep early yesterday and didn't post. But given my No. 3 resolution for 2014 -- to relax -- I'm not gonna sweat it. Here's to getting back on track. To settle into my new home. I imagine numbers 2 and 3 will probably go hand in hand. There are also a few things I'd like to learn how to cook this year -- including my mother's "oven sandwiches" and kadala, a Keralan breakfast stew that I adore. But there will be time to discuss all of those later.